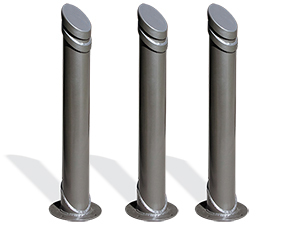 Dynamic and durable, the Fairfax Series Bollards are built ready for a variety of settings, offering smart visual appeal and stout perimeter deterrent. These strong, modern style bollards are constructed with a commercial grade steel, crafted with modern detailing and available in an ultra-resilient powder-coating finish. Popular for strategic placement along building exteriors, streetscapes, cross-walks, park landscapes to preserve the overall well-being of high-traffic community areas.